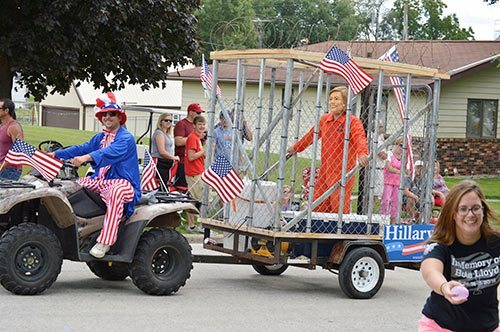 Iowa parade goers were treated to a depiction of Hillary Clinton in jail. The men were handing out WATER BALLOONS to throw at the caged Hillary! It was a typical summer celebration in small-town Iowa. The sun was shining on children carrying bags full of candy as the Arcadia Fire Department was celebrating its 100th anniversary on Saturday with a parade, a party in the park and a big water fight that would serve as the grand finale. A young blond boy, no more than 8 years old, ran out into the street near the intersection of West Center and South Gault streets because one float was handing out water balloons. The child grabbed his balloon, took aim and did his best Nolan Ryan impression as he fired the balloon at a man dressed in an orange jumpsuit and Hillary Clinton mask while standing on a platform inside bars, fencing and barbed wire above a “Hillary For Prison” sign tacked onto the side. The prideful smile of a job well done was written all over the boy’s face. Julin said he, Reetz and Adam Corky (Clinton impersonator) are not affiliated with any official political organization. Julin said he’s an independent and as of March 2014 Reetz was a registered Democrat. Julin said the crew had been throwing around the idea of entering the parade for a while. As a side note– My mother graduated from Odeboldt High School many, many years ago. She was also a good Republican.